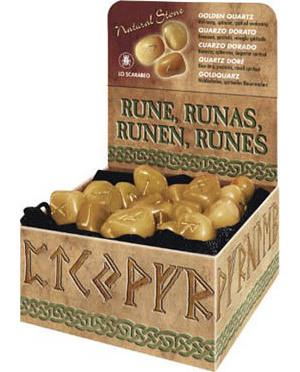 Each of these Gold Quartz runes bears one of the twenty four traditional symbols of the Elder Futhark runic alphabet except for a single crystal that has been left blank. Created by Lo Scarabeo from Golden Quartz these divination crystals may vary in color. Each rune set comes in a decorative box containing 25 Golden Quartz crystals, a black velveteen bag, and a rune instructional booklet.